Martin Brodeur set the all-time wins record with a 3-2 decision over Chicago on March 17. 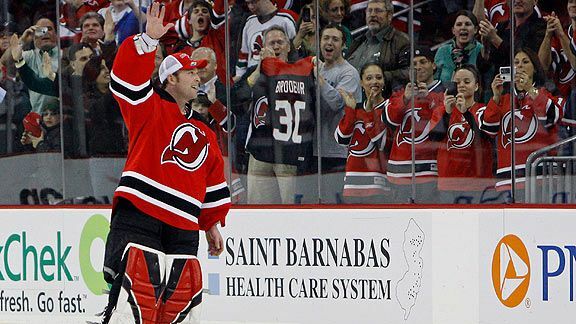 Matching history on March 14, 2009: Brodeur celebrates win No. 551 with his father, Denis. Martin Brodeur has played his entire NHL career with the New Jersey Devils. Martin Brodeur was drafted by the Devils in the 1990 NHL draft (first round, 20th overall). NEWARK, N.J. -- Martin Brodeur pumped his fists before being swallowed by jubilant teammates and the packed house at the Prudential Center chanted his name over and over. But here's the thing: If history suggests something musty and complete, then this moment wasn't history, because Martin Brodeur looks like he's just getting warmed up. Maybe that's why when the New Jersey Devils goaltender gave up trying to scissor his way through the netting around his goal and took a victory lap around the ice following his NHL record 552nd regular-season win Tuesday night, it was less about celebrating the completion of a task and more about celebrating something more. After he embraced his father, Denis, who spent most of the night with his ever-present camera trained on his son, and met briefly with NHL commissioner Gary Bettman, Brodeur talked about his relief that it was over. That was, in fact, his first thought when the buzzer ended in the New Jersey Devils' 3-2 victory over the Chicago Blackhawks. "And, again, I didn't want this chase to this record to be a disturbance to the team because we played so well all year and now we're coming into a last stretch here to get ourselves into the playoffs. And I didn't want it to drag too long." 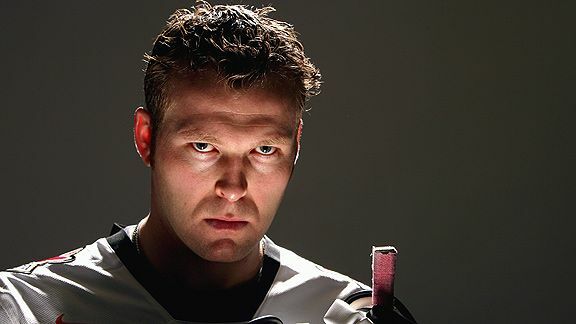 Martin Brodeur still seems intent on proving he's the best. Others were more flamboyant, like Patrick Roy, and had colorful nicknames, like the China Wall (Johnny Bower), Mister Zero (Frank Brimsek) and The Dominator (Dominik Hasek). Others were more controversial, like Sawchuk. Others, like Hall, were hard competitors. Hasek was as inventive, if not more so. Grant Fuhr was more obviously athletic. Moreover, while all of those goaltenders have their supporters, none really has what could be considered a widely held strike leveled stubbornly against him by critics. That would be the fact that since entering the NHL, he has played for the New Jersey Devils. 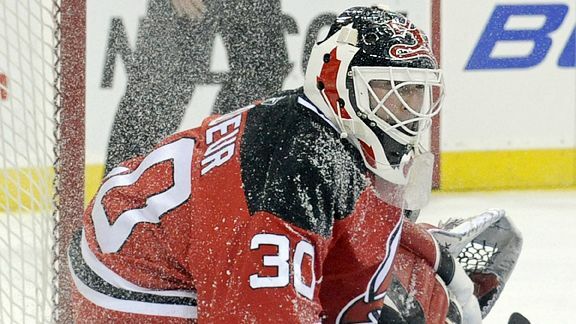 Without that team's suffocating approach to the game, the argument goes in some corners, Brodeur would never have been able to achieve the heights which he has scaled. That playing his entire career for a team once labeled a "Mickey Mouse organization" by Wayne Gretzky is viewed as a whopping advantage by some is, to say the least, historically amusing. As well, of the three Devils championship teams, none will be confused with the greatest clubs ever to grace the ice. Many goalies have played on better teams than Brodeur. When Brodeur played his first game for the Devils in March 1992, they were an improving, emerging franchise, but hardly a powerhouse. Moreover, they were a team still in search of a personality. That personality was supplied by Jacques Lemaire when he arrived for the 1993-94 season. It was GM Lou Lamoriello's admiration for the Montreal Canadiens that led him to Lemaire's doorstep, and Lemaire introduced the same style and values to the Jersey squad. Defense first. Team over individual. Energy and hard work trump talent. It was that season Brodeur, for the first time, played more than half of Jersey's games, giving the team its first bona fide starting goaltender since Sean Burke. It was equal parts of Lemaire and Brodeur, then, that made the Devils develop into the type of team they became. That said, it's a mistake to treat the Devils as if they've been the same clogging, mind-numbing, excitement-killing team for the past 16 seasons, with Brodeur as the key beneficiary basically leaning on his goal stick with nothing to do. There have been times, such as during the era when Jason Arnott, Petr Sykora and Patrik Elias were one of hockey's most dangerous forward lines, when the Devils were the best offensive team in the NHL. They missed the playoffs after winning their first Cup in 1995, and were bounced in the first round in 1998 and 1999, again in 2004 and last season. Yes, at times, New Jersey boasted a terrific blue-line corps that included Scott Stevens, Scott Niedermayer and Ken Daneyko. In recent seasons, however, players like Johnny Oduya and Paul Martin have become the go-to defenders, but as the shot totals have increased, the goals-against numbers for the Devils have not. Since Lemaire's time, meanwhile, the Devils have had seven different coaches in a decade, a remarkable amount of turnover behind the bench for a franchise known to be among the NHL's most stable. The common denominators during all of this time have been the goaltending of Brodeur and the management of Lamoriello. Everything else has changed with the Devils except those two factors. Damien Cox, a columnist for The Toronto Star, is a regular contributor to ESPN.com. 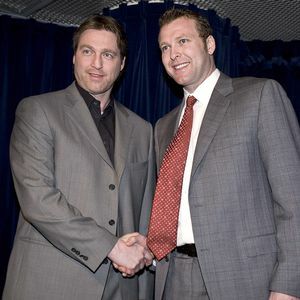 When Martin Brodeur tied the greatest goalie record in NHL history, Patrick Roy was on hand March 14 in Montreal to cheer him on. With the Devils' 3-1 win over the Canadiens on March 14, Brodeur picked up win No. 551 to match Roy, matching the mark in front of his family in his home province of Montreal. "It's something very special that he's doing right now," Roy told ESPN.com. "It's something that he should be proud of." Those warm wishes might surprise some, given the intense rivalry the superstar goalies had when Roy was still playing. But that's what it was, Roy said, a healthy and very competitive rivalry, certainly nothing personal. "I would say it's probably more of respect more than anything else," Roy said when asked to describe his relationship with Brodeur. "Obviously, we both are very competitive persons. At the time [when Roy still played], knowing that if we wanted to win a Stanley Cup there was a good chance we had to play against each other, we both had the same objective. We wanted to bring our team to the next level, we both wanted to win the Vezina, so there was a bit of competition between the both of us. "But I'd use the word 'respect' when you ask me [about the relationship]." But close? No. Roy was already a superstar with two Stanley Cup rings by the time Brodeur broke into the NHL full time in 1993-94. They were of different generations (Brodeur remembers being a kid and seeing Roy at the Stanley Cup parade in the streets of Montreal in 1986). They crossed paths as teammates for Team Canada at the 1998 Nagano Olympics, but that was about it. "We never took time over the years to go have a beer or talk really or anything like that," Roy said. "Even in Nagano, I was doing my thing and he was doing his thing. But I have a lot of respect for him." It's interesting Roy brought up Nagano. During Team Canada's flight from Vancouver to Nagano in February 1998, Brodeur was incensed when coach Marc Crawford informed him he would not play a game in the tournament unless Roy was injured. From Crawford's point of view, he probably figured it made sense to lay it out ahead of time that Patrick was his guy, so there was no confusion. 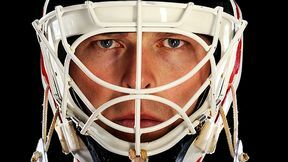 But Brodeur took it as a personal affront, which he detailed in his autobiography, "Brodeur: Beyond The Crease," co-written with Toronto Star columnist and regular ESPN.com contributor Damien Cox. And Brodeur, at the very least, thought he should have started the bronze-medal game against Finland. But he went home without having played a single minute, and, to this day, he is sour about it. "I don't recall any of that, to be honest with you," Roy said when we asked him about Brodeur's frustration with the Nagano situation. "All I recall is that after we lost to the Czechs in the semifinals, I had to go for the [doping] test. It took me a long time. When I came out, everybody was gone. Then, I went back to the village and we had a special team meeting at night. There was a lot of talk about how we wanted to deal with what was going on [playing for bronze]. Crawford came to me and he said, 'You're playing.' I wasn't aware that Martin [wanted to play that day]. "I understand, it's hard to make a team like this where all players play big roles on the team," Roy continued. "I'm sure that Marty wanted to play in the tournament, for sure he felt he could have contributed to the success of the team. And I would have understood if the coach would have wanted to make a goalie change [for the bronze-medal game]. I would have had no problem with that." The Nagano episode, at least from Brodeur's point of view, spiced up their rivalry, which culminated in the 2001 Stanley Cup finals matchup between the two goalies, won by Roy's Avalanche in seven games after Colorado rallied from 3-2 down in the series. To Roy, that 2001 series spoke to the intense but respectful rivalry he believes he had with Brodeur. And with win No. 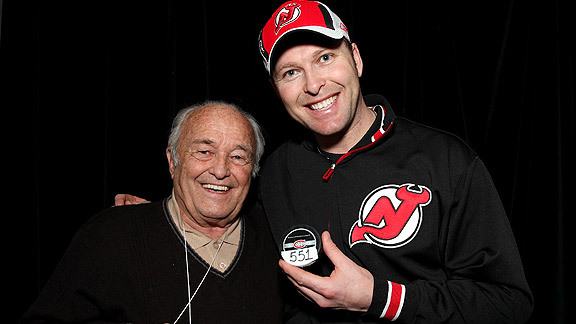 552 soon on the way for Brodeur, Roy insisted Thursday that he passes the torch with pride. "I'm very happy for Martin," Roy said. "I knew when I made the decision to retire, Martin would break that record eventually. I felt very comfortable with it. I'm really happy for him. He's a great competitor. It's amazing how he's handled playing so many games year after year, and succeed, as well. "He's performed at a high level, facing the expectations year after year. He should be really proud of himself. If someone knows how hard it is to get there, it's me, and I certainly can appreciate what he's doing. He also has something that's really special, he has a great approach to the game." • Brodeur and Roy started against each other 17 times in the regular season. Brodeur won nine games; Roy, eight. • They started against each other seven times in the postseason. Roy won four contests; Brodeur, three. 10. Win No. 1 (3/26/92): Some six weeks shy of his 20th birthday, Brodeur recorded his first NHL victory -- a 4-2 decision over the Boston Bruins. On double emergency recall from his QMJHL team (St. Hyacinthe), Brodeur made 24 saves in the victory over Bruins veteran Andy Moog. 9. 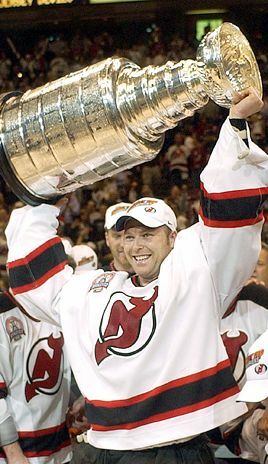 2003 Eastern Conference finals, Game 7 (5/23/03): Brodeur draws on his big-game experience in the decisive battle of the series. The Devils blew a 3-1 series lead and seemed on the verge of falling to the suddenly energized Ottawa Senators. To make matters worse, veteran center Joe Nieuwendyk managed just three shifts due to injury. With a short bench, Brodeur provided sure goaltending, stopping 24 of 26 shots in a gritty 3-2 road win. 8. 2000 Eastern Conference finals, Game 7 (5/26/00): The Devils overcame a 3-1 series deficit against the Flyers, rallying to capture the series and earn a berth in the Stanley Cup finals. Brodeur was razor-sharp in the decisive game, stopping 26 of 27 shots in a tight 2-1 game that was best remembered for the crushing hit New Jersey defenseman Scott Stevens delivered to Philadelphia star pivot Eric Lindros. The Devils netminder surrendered just three goals in the final three games of the series. 7. 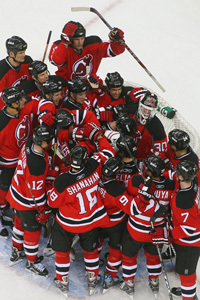 Sweeping Manhattan (4/29/06): Brodeur and his teammates were simply giddy after sweeping the rival New York Rangers. In their three previous playoff series meetings (1992, 1994 and 1997), the Rangers had eliminated the Devils. Breaking out the brooms at Madison Square Garden was particularly gratifying for the Devils, who, despite three championships, skate in the shadow of the Original Six franchise in the tri-state area. Vote now: Who's the best goalie? As Brodeur closes in on history, we want to know where you rank the future Hall of Fame goaltender. Where do other all-time greats like Dominik Hasek and Ken Dryden rank? Have your say on our greatest goalies ranker! From being drafted by the New Jersey Devils in the first round of the 1990 NHL draft to his three Stanley Cup wins to his return from injury this season, check out the goalie's career in pictures. We decided to hash out a debate that realistically has no definite answer: who is the best goalie of all time? But there was some solid debate from our intelligent puckheads at ESPN.com. • Marlowe7789: Dominik Hasek has to be the one ... back to back Harts, 6 Vezinas, and an Olympic Gold for the Czech Republic. He didn't even become a full-time starter until he was what 28? 29? Highest Save % of ALL TIME. Brodeur may be an excellent stick handler, but Hasek didn't even need a stick to be spectacular. Roy may have won a ton of cups and was certainly clutch but Hasek played most of his career with a poor Sabres team that would have had no business in the playoffs without him. • petechs: Sawchuk played only against the best. He only had to face 5 teams a year and each team was loaded with talent. Today, with 30 teams, you have a watered down league, with the bottom teams being easy (usually) wins for a goalie. Sawchuk! NO mask, no weak teams. Case closed! This is a bit of a trick, perhaps, because the NHL had only a handful of teams and played such a limited schedule in its first two seasons, but Vezina had been a star in the old NHA and carried over that success to the new league. Before he became the first goalie to wear a mask in games (briefly, in 1930), he was on four Stanley Cup winners -- the Ottawa Senators in 1920, 1921 and 1923 and the Montreal Maroons in 1926 -- and twice had four shutouts in the playoffs. He had 163 regular-season wins in the 1920s. He burst on the scene in the late 1920s, getting 22 shutouts in 44 regular-season games in 1928-29 and winning the Vezina Trophy for the third consecutive time that season. But in the '30s, he had 170 victories and won two Stanley Cups with the Canadiens. The short guy few called "Walter" lost two seasons to military service during World War II, and the Maple Leafs won the Cup in one of them. But during the decade, he still helped lead Toronto to the championship four other times and compiled 203 regular-season victories. One of the reasons he was able to set the record that stood for so long was that he was great from the start, earning 291 wins in his first 10 seasons after joining the Red Wings in 1949-50. With him in the net, Detroit won the Stanley Cup three times during the decade. Jacques Plante was also terrific for the Canadiens in the latter half of the decade, winning 185 games and the Vezina four times, but Sawchuk gets the nod. A tough call over eventual St. Louis Blues teammate Plante, but Hall had more wins in the applicable years -- 261 to 203 -- and won the Cup with the Blackhawks in 1961. Both had also been first-team All-Stars twice in the '50s, to Sawchuk's three times. His career was confined to this decade, so his lack of huge aggregate numbers isn't an issue. Despite missing a complete season, he won a stunning 258 games, playing with -- among others -- veteran center Jacques Lemaire. Dryden won or shared the Vezina Trophy five times and also was a first-team All-Star five times. Yes, those were great teams, but he was the best there was. Another tough one: Smith or Grant Fuhr? Fuhr won the Vezina once, had 211 regular-season victories and was on four Cup winners. Smith, statistically "hampered" to an extent because he was so often splitting time, had 192 wins. The Isles had the dynastic run from 1980 to 1983 and Smith won the Conn Smythe once. Each player was also a first-team All-Star once. Smith, in a close call.